Air Farce is a Battle minigame in Mario Party 7. Its name is a pun on "Air Force". The players are shown on a platform with gliders from a bird's eye view, which transitions to a side view. All players start on a large platform, with hang gliders, and they need to glide over a long area of water, passing measuring points. Players who fall into the water will be out of the game. 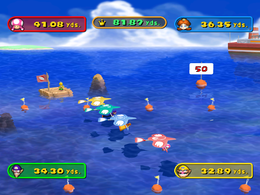 The player who can get the farthest before falling into the water wins the minigame. This is one of the minigames that can appear in Decathlon Castle. Here, the player's objective is to glide the furthest as possible to earn as much points as possible, up to a maximum of 1,000. The players do their winning and losing animations on the starting platform. Rules – "Strap yourself into the hang glider and fly as far as possible"
Advice – "Drive first to pick up speed, then fly parallel to the water to cover the greatest distance." This page was last edited on March 27, 2019, at 01:11.